Editorial Team of ezine PreSense wishes all readers a very happy and prosperous New Year 2017. 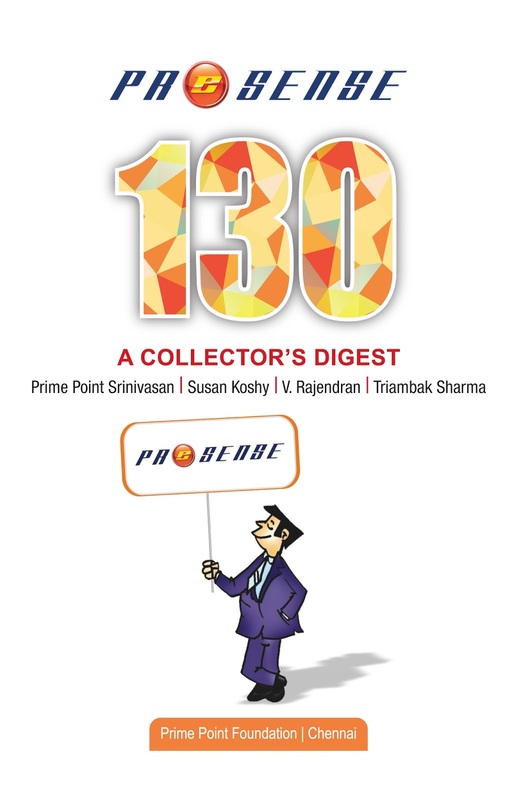 We are pleased to release the 118th (December 2016) edition of PreSense broadly with the following contents. 1. Editorial : Susan Koshy in her Editorial emphasises the need for adopting the changes. She quotes the case study of a village in Andhra Pradesh as to how the villagers have adopted digital transaction after Demonetisation. 2. Cover Story: Dr R Jagannathan and K. Srinivasan explain the various facilities available and procedures to move towards the Non-Cash transactions comfortably. 3. Ignited Minds: K. Srinivasan writes about K. Balu, an Advocate, who got the landmark and historic Judgment from Supreme Court to remove all liquor shops and bars from the National and State Highways across India, to be effective from 1st April 2017. Liquor may not be available on the Highways in future. 4. Nation: Sukruti Narayanan analyses the performance of Winter Session of the Parliament and the achievement of toppers up to the end of Winter Session 2016. 5. Prince Cartoon: Triambak Sharma's interesting cartoon on the impact of Demonetisation. 6. From the Archives of Dec 2010: How the increasing life expectancy has impacted the youth? The present generation may spend more years sick. We are confident that you will enjoy this edition too. 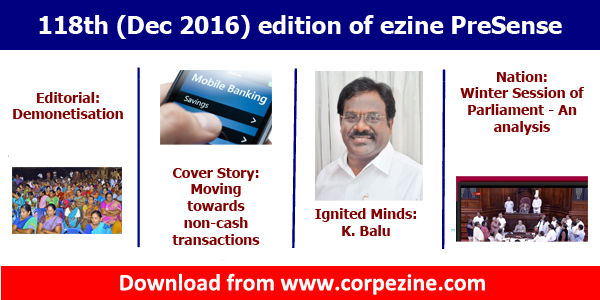 Please send us your feedback toeditor@corpezine.com. As announced earlier, we have started a new portal Digital PreSensewww.digitalpresense.com to frequently update with articles. Please keep visiting the site also. Guest writers are allowed in the new portal.